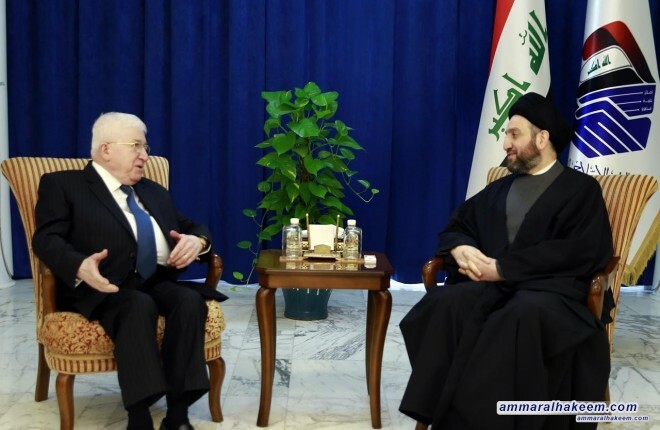 His eminence with Masum discussed latest developments in the political situation in Iraq, and called to invest all potentials and capacities to end political impasse in Iraq, and called on political blocs to bear their responsibility in this direction. His eminence discussed developments of regional and international political situation, renewed his call for dialogue and to adopt political solutions, stressed the centrality of Iraq international and regional issues because of experience, historical heritage and geographical and demographic components. His eminence praised peaceful transfer of power and the image presented by Iraq in this regard, as a model for the region and the world. Regarding relationship between the federal government and regional government, His eminence called for efforts to solve all differences through dialogue and concession for public interest, stressing that Iraq and its wealth are for all without exception or discrimination.